There are plenty of Rachmaninov recital CDs on the market these days, but most are début albums from aspiring pianists, usually in their early 20s. 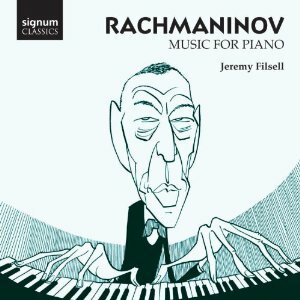 Jeremy Filsell doesn't fit into that category, and it is clear from his performance that his aims with Rachmaninov are entirely different. The attraction of this music for younger pianists trying to establish a reputation is surely that Rachmaninov wears his virtuosity on his sleeve – it sounds as difficult to play as it is. But Filsell demonstrates that there is far more to Rachmaninov than that. As both a pianist and an organist he has a reputation of making light of technical demands, so he has nothing to prove here. Instead he puts his copious keyboard skills to the service of the music. The result is a deeply poetic reading of these Rachmaninov favourites. The playing is precise and the interpretations are keenly focussed, yet there is no hint of dryness Rubato and pedalling are generously applied, but never to excess, and the melodic lines are always allowed to sing. The Prelude in C sharp minor is given an appropriately atmospheric reading, with those sinister pianissimo chords in the opening passage loaded with anticipation for what is to come. And when the music does take off, it becomes clear that Filsell is a more moderate and level-headed interpreter of this work than many, including the composer himself. Many of the other works give that impression too, as if Filsell has retained the passion in Rachmaninov but avoided the neurosis. Between this and the concluding Second Sonata, we are treated to two song transcriptions and the Op.23 and Op.32 Preludes. That all makes for a satisfyingly diverse programme, although even for Rachmaninov these works are on the note-heavy side. Not that programme ever feels dense or congested. On the contrary, Filsell makes such light work of the technical demands that the individual notes dissolve into the endlessly varied and expertly controlled textures. The audio is good and complements Filsell's technique, in that both balance the detail with the bigger picture. So the precision of the passage-work is always clear, both from the playing and the reproduction, yet the listener is able to take that more or less for granted and concentrate on the drama and passion of the music. And while the sound is precise, it is never over-analytical, thanks in part to the resonant acoustic of the Wathen Hall at St Paul's School in Hammersmith. The Second Sonata provides a rousing finale to the programme. Filsell plays the revised 1931 version of the work, although you have to dig deep into the liner notes to find that out. It is an appropriately big-boned reading, by turns expansive and intimate. It is a much performed (overperformed?) work, but Filsell gives a performance that can compete with the best on disc. The distinctive traits of his Rachmaninov again shine though, the effortless command of the technicalities, the even-handed approach to dynamics and phrasing, but above the passion and engagement that both transcends those technical accomplishments and makes them all worthwhile. An excellent disc of Rachmaninov piano music, no matter how many you already have on your shelves.